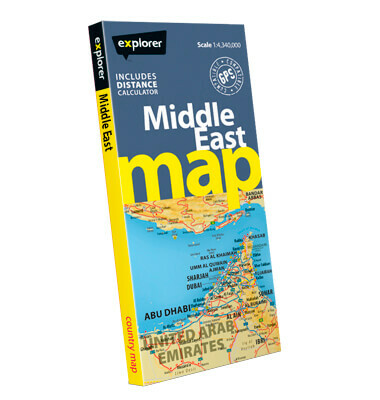 The new Middle East Map is the most accurate and comprehensive map of the Middle East, and the best way to find your way around the region. With a clean, easy-to-read design, the whole of the Middle East is covered on one map that reaches UAE, Oman, Yemen, Saudi Arabia, Bahrain, Qatar, Kuwait, Syria, Jordan, Lebanon, Turkey, Iraq and Iran. Using the most up-to-date mapping available, it shows all cities, towns and villages, and key landmarks such as hotels, airports, markets, mountains and wadis, with a handy directory of map references so you can easily find your way about.